Meridian is a Cambridge based audio company known in the audiophile circle as a good trusted brand when it comes to sound quality. Their products are on the upper end of the market and, as all their products are designed and manufactured in the UK, therefore comes at a premium. The Meridian Explorer is a product aimed at cornering the slightly lower end of the market, and to a different segment of audio lovers. 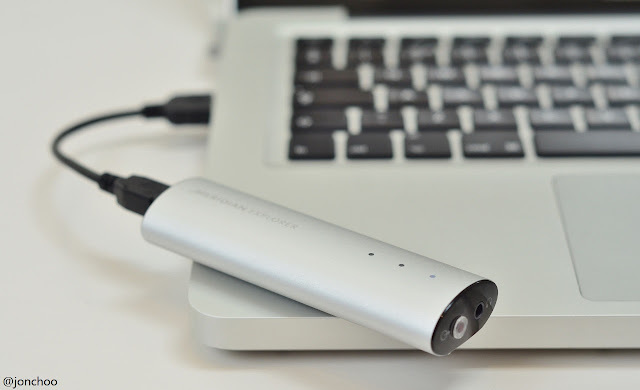 The pocket size USB DAC is designed for those who mainly listen to music using computers. It is a growing segment of the audio market. Long gone when you need a PC size amp and book shelf speaker in order to enjoy good audio quality. The Explorer in intended to do two things. It is designed first to bypass a typical PC's soundcard (which are normall inadequate), routing the digital file through the USB onto the Explorer's on board Texas Instrument DAC. This by itself will almost always make a difference for the better. The second thing the Explorer does is up sample the audio file. A CD and MP3 file typically contains audio tracks in 16-bit resolution and 44.1kHz sampling, which is adequate for majority of music listeners. However to some, this isn't enough. You can find albums encoded in 24/192, but these are rare and expensive. The Meridian Explorer on the other hand is designed to take these 16/44 files and resample them. This isn't quite the same as buying audio files encoded in native 24/192, and is similar to buying a Blu-Ray player that is capable of up sampling a 1080p source for playback onto a 4K monitor. The Explorer is shipped in a simple black box. Along with the USB DAC itself, you will also find a short mini USB cable, a small case and an instruction manual. No drivers is included as installation but you can find them at Meridian's support website. Once I downloaded the necessary drivers, the installation process took a couple of minutes. After that simply plug in a headphone into the 3.5mm mini jack socket the Explorer was ready to use. Unfortunately, the installation on my partner's Macbook Air did not go according to plan despite following the instruction detailed in the user guide. It was frustrating and after 30 minutes of huffing and puffing, we gave up. Incidentally, the Macbook was running on OS X 10.6.9, which is higher than the required version 10.6.4. I noted that during the demo we had with Meridian about a month ago, the Explorer was working perfectly fine with the Macbook Pro, though it did encounter issues when attempting to switch sources. The Meridian Explorer is extremely well made. While it is a bit light, and thus felt 'cheap', it actually looked the business. And as it is designed for laptops (you could also use it on a desktop if your wish), the lightness is actually a positive point. You could chuck it into your laptop's bag each time you travel never having to worry about listening to anything lesser. The Explorer also contains a line output for use with an external amp. Its bigger but more expensive brother, the Meridian Director, is designed to be plug into source with optical or coax S/PDIF. My usual standard set up for listening to music via a desktop is through my ThinkPad T420s laptop with either a Sennheiser IE 8 in-ear monitors or Audio Technica ES-7 (and many others in between, but these are my two main headphones I know best). Music are played via Media Monkey, with all files encoded in either FLAC or MP3 (-V 0 quality) file format. At times I would throw in a bit of Spotify here and there, which I know are heavily compressed (sorry, not a premium user). It is debatable whether humans can audibly tell the difference between 16/44 and 24/192 audio files. The increase in sound resolution will no doubt have an impact on sound quality, that's a given. Even so, will up sampling anything has an effect? Fujifilm attempted something similar through photography by increasing the resolution of a photo higher than what the actual camera sensor was capable off, to varying degree of success. It is important that the source is sufficiently high quality, as there isn't any point believing that the Explorer will magically turn crappy 128kbps MP3 files into something listenable. In terms of actually improving over my laptop's on board sound card, the Explorer passed with flying colours. Not only was the clarity of music improved, the bass was tighter (not bloated like what you get with certain brands). I wouldn't classify the sound as neutral, but again the sound signature will depend on the headphone and source that one uses. Bass is tight, clean and precise. Dynamic range is amazing, as is the clarity. Vocals in particular stand out. Simply put, this is one of the best sounding device I've listened through, and that's saying a lot because normally listening to music through my laptop isn't high on my to do list. The idea of spending £250 on an audio equipment might sound ridiculous, but in my honest opinion the Meridian Explorer is worth every penny. You will still need a good pair of headphones to take advantage of this product, but can you really put a price on good sound? In fact, I would actually consider the Explorer a great value investment for those who are primarily listen to music through their PCs.